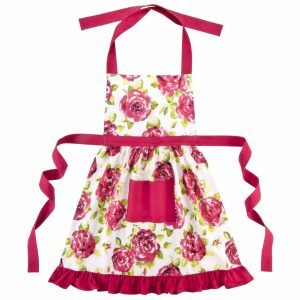 Encourage your children to enjoy cooking and baking by giving them their very own Betsy Girls Frilly Apron Pink. This beautiful kids apron is made from 100% cotton. 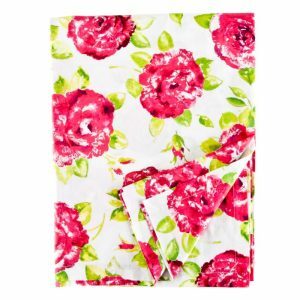 It features our classic pink ragged rose design scattered across a white background. With vibrant lime green leaves to add even more colour! There’s a useful front pocket to store tissues and any other small items. The ties of our Betsy Girls Frilly Apron Pink are adjustable as is the neck strap which has a popper. The apron ties, popper neck strap and front pocket are plain fuchsia pink. The full length is 60 cms and the bib section measures 21 x 20 cms with the waist section being 21 cms. 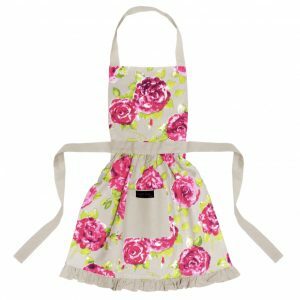 How cute can you get with our mini version of our Adults Betty Frilly Pink Apron? In this 50’s style vintage frilly pinny, what little girl could resist helping her Mum or Grandma in the kitchen! The Betsy Girls Frilly Apron Pink measures 60cm from bib to hem. 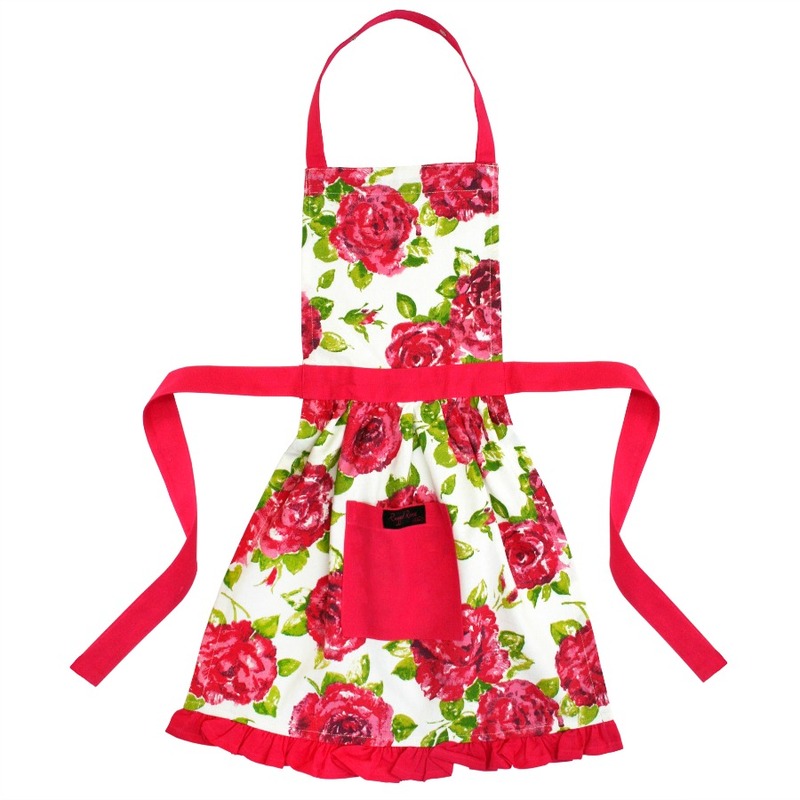 The apron is suitable for girls aged 3 to 8 years old. The whole family may be inspired to get into the kitchen as the Great British Bake Off returns to our TVs. 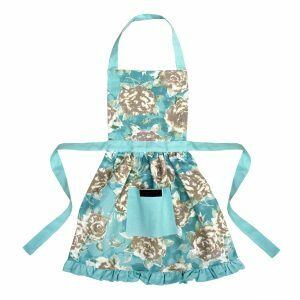 If that’s the case, you can protect your clothes by wearing one of these gorgeous cooking aprons. Our Billy Aprons are perfect for the men in your life if they love to cook too! The Betsy Girls Frilly Apron Pink is suitable for a machine wash if it gets dirty. Just wash at 40 degrees with low detergent. Once washed, hang it up to dry. Obviously, wait until it’s completely dry before wearing it again! There’s a variety of matching items to go with your Betsy Girls Frilly Apron Pink or the adult Betty Frilly Pinny. 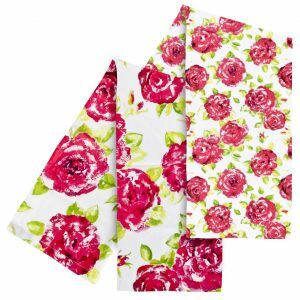 Choose from our Tracy Tea Towels, floral Oven Gloves, Tessa Tablecloths and stunning fabric Natalie Napkins. Fabulous accessories for hosting the perfect Afternoon Tea or Garden Party, wouldn’t you agree? 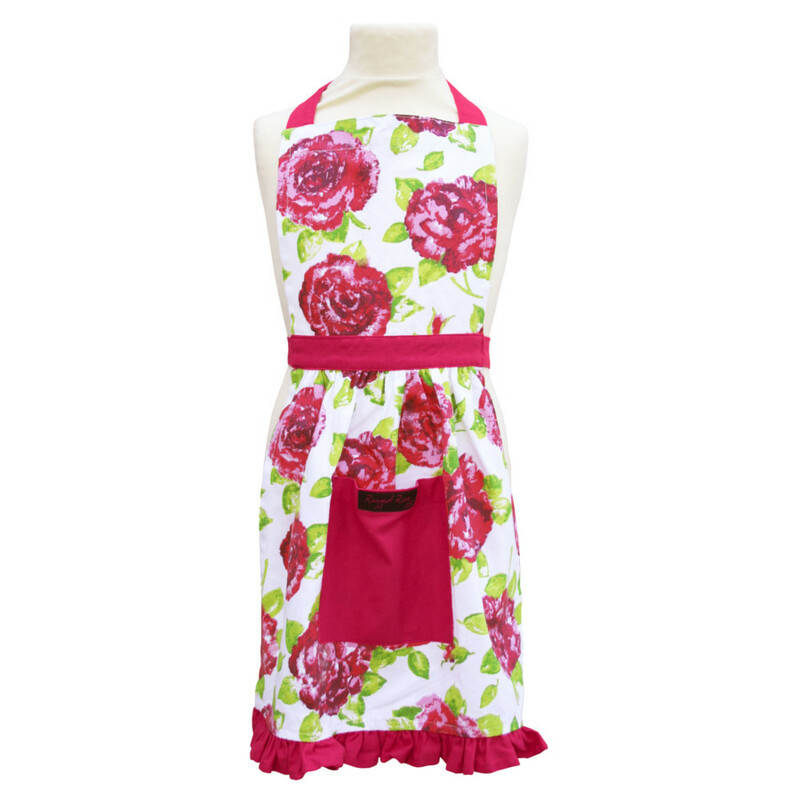 The Betsy Girls Frilly Apron Pink will also make a great gift idea for Birthdays or Christmas!